It's trendy to go low-carb these days, even no carb. And, yes, this can lead to quick weight loss. But ditching carbs is tough to do over the long haul. For starters, you're swimming upstream. On average, adults in the U.S. get about 50 percent of their daily calories from carbohydrates. And, if you truly cut out all carbs, you'll have to give up fruits, vegetables, whole grains and beans — which are the building blocks of a healthy diet. So, why do carbs get such a bad rap? Well, as we discuss in our new Life Kit podcast, a lot of us are choosing the wrong kind of carbs. "We've known for decades that different foods affect the body differently," says Dr. David Ludwig. He's a professor of nutrition at the Harvard School of Public Health and the co-director of the New Balance Foundation Obesity Prevention Center Boston Children's Hospital. So, let's compare two carbohydrate-rich foods. If you're shopping in the bread aisle, you can pick white bread or a whole-grain bread, maybe pumpernickel or rye. They may have about the same number of calories, but the whole grain has a lot more going for it. I know if I eat a scone or chocolate croissant for breakfast, I'm hungry an hour later. But, if I eat an egg and a piece of whole grain toast, I'm set until lunch. Here's what to visualize: When you eat whole grain wheat bread, you're getting everything that comes in the wheat kernel. This includes the fiber-rich bran. It also includes the germ, which is the embryo of the seed, so it contains everything that's needed to nurture new life. Think of wheat germ as a little packet of nutrients, including zinc, magnesium and Vitamin E.
But with white bread, all this good stuff has been stripped out during processing. All that's left is starch, which is one step away from turning to sugar in your body. "Refined starch is the hidden sugar," says Dr. Dariush Mozaffarian, dean of the nutrition school at Tufts University. And it's not just white bread. Many of the packaged snacks we eat, such as pretzels and crackers, are often made from refined starch. So when you eat these foods, that starch can "slam into your bloodstream, raising blood sugar and insulin," Ludwig says. And this can send a signal to the body to store fat and leave you feeling hungry. I've experienced this. I know if I eat a scone or chocolate croissant for breakfast, I'm hungry an hour later. But, if I eat an egg and a piece of whole grain toast, I'm set until lunch. That's because I'm getting plenty of fiber — which slows down digestion — as well as fat and protein that leave me feeling sated. So I've cut back on refined carbs. And the science suggests this is the way to go. 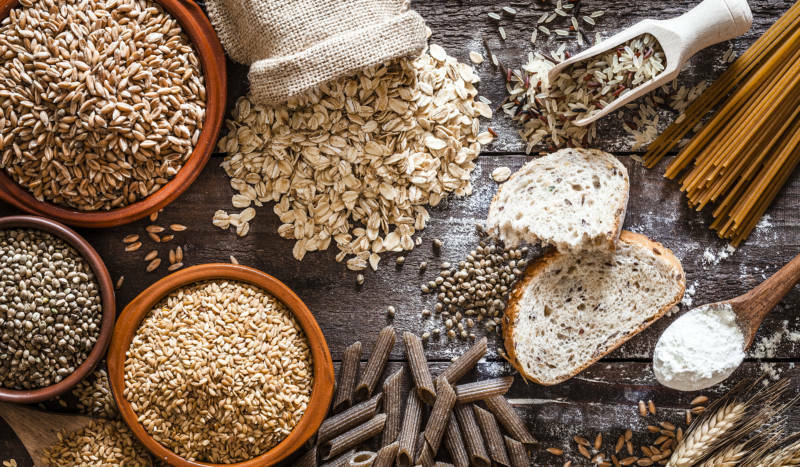 The authors of the latest Lancet study say their findings "provide convincing evidence for nutrition guidelines to focus on increasing dietary fiber and on replacing refined grains with whole grains." U.S. Dietary Guidelines recommend that at least half of your daily grain consumption should come from whole grains. But currently, most Americans under-consume whole grains and exceed the recommended limits on refined grains. David Ludwig says it's time we "just get off the roller-coaster" — the cycle of spiking blood sugar and hunger that refined carbs can cause. He says aim to replace refined carbs with whole fruits (the fiber in them slows digestion), beans, nuts, a variety of healthy fats and plenty of protein. So, what does that look like on our dinner plates? David Ludwig has teamed up with his wife, Dawn Ludwig, a professional chef. They've collaborated on cookbooks designed to help people eat smarter. "I don't want anyone to feel deprived ... or that they have to give up anything," Dawn Ludwig says. "I want to meet people where they are." "I do a lot of really simple five-minute sauces that I have in my fridge that I can pull out" for dinner, Ludwig says. She tosses all the ingredients for the sauces in Mason jars and mixes them in the jar with one of those stick-like immersion blender, so there's not much clean-up involved and they store well in the refrigerator. And, here's one final tip for all of you who have a hard time turning down a baguette, croissant or warm basket of rolls: Eat them at the end of a meal. Why? A small study published a few years back found that, compared with eating bread at the beginning of a meal, people who saved the rolls for the end had a 30 percent lower peak in blood sugar. Now, this may not have the same effect on everyone, but it suggests that timing matters. NPR's Maria Godoy contributed to this report. Prep time: 5 minutes. Makes about 1 cup. Place all the ingredients in a wide-mouthed mason jar or cup that will fit an immersion blender without splashing. Pulse a few times to blend until the cashews are in small pieces but still chunky. Place a lid on the jar. For best results, set aside for at least one hour to allow the flavors to develop. The dressing will keep in the refrigerator for one to two weeks. Place all the ingredients in a wide-mouth mason jar or cup that will fit an immersion blender without splashing. Blend, working the blender into the pieces of ginger until smooth. Add additional water as needed to reach the desired consistency. Place a lid on the jar. For best results, set aside for at least one hour to allow the flavors to develop. The dressing will keep in the refrigerator for one to two weeks. Prep time: 7 minutes. Makes 2/3 to 3/4 cup. Place all the ingredients in a wide-mouth mason jar or cup that will fit an immersion blender without splashing. Blend, working the blender in the jar until the garlic, ginger and turmeric are smooth. Place a lid on the jar. For best results, set aside for at least one hour to allow the flavors to develop. The dressing will keep in the refrigerator for up to two weeks. Prep time: 5 minutes. Makes about 1 3/4 cups. Place all the ingredients in a wide-mouth mason jar or cup that will fit an immersion blender without splashing. Blend until the orange is fully blended and the sauce is thick and creamy. Adjust seasoning to taste. Place a lid on the jar. Allow the flavors to develop for one hour or more in the refrigerator. The dressing will keep for about a week. These recipes are excerpted from Always Delicious, by David and Dawn Ludwig, and Always Hungry? by David Ludwig and are used with permission. Copyright 2019 NPR. To see more, visit www.npr.org.